On a brief and visit to San Luis Obispo, an unexpected bonus was the unusual wildlife about town. On the way back, I noticed a small figure in the gutter just below the curb, scratching and nosing around in the litter there. 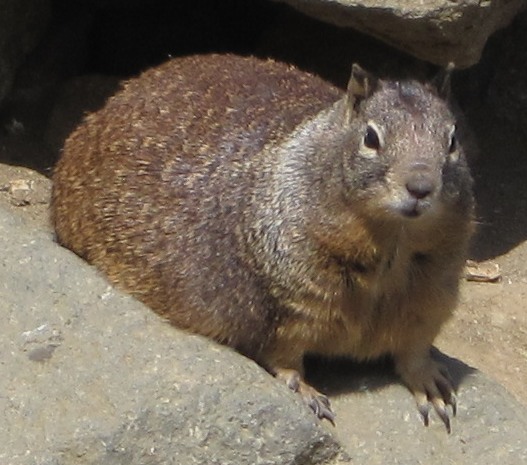 It was the size and shape of a chipmunk, but its coloration showed it to be a California ground squirrel -- a baby, probably on one of its first forays out of the burrow. Burrow? Well, as I pulled my camera out of a pocket, suddenly the youngster vanished. I stepped into the street to see where it had gone -- and discovered that SLO has gutter drain holes in their concrete curbs that are exactly the size and shape of a typical ground squirrel's burrow entryway. Back in SLO, we walked on, marvelling at the little squirrel -- and half a block later, another squirreling the same size as the other one dashed out from under a car, ran to the curb and disappeared. Yep -- another of those round gutter holes. They must have a whole colony of these cuties! Then just a few blocks later, I noticed motion out of the corner of my eye ... and turned in time to watch a pair of scarlet macaws fly across the street, up an adjacent street and into a tree. I read an article once from a biologist who visited South America and thrilled to the sight of these huge, bright red, long-tailed parrots flying free ... but I never expected to see the same thing on the street of a California city.